A common myth or misconception is that a chemical or product is used to polish marble... to make dull marble shiny. Well... it's only natural since there are products labeled as a "marble polish" and you can "polish" other surface types like brass or wood with a product. Also, you may see a hotel or mall maintenance person using a big buffing machine to "polish" a marble floor. However, nearly all marble polishing products are simply topical dressings that slightly showcase or enhance the shine of a polished surface, BUT they do not produce the shine. And the hotel floor buffer isn't actually creating the shine or "polish" on the floor. It is already there. The buffer along with some type of topical dressing is simply making the polished marble look it's very best. It's just like cleaning a mirror with Windex. The Windex doesn't make the mirror reflective or shine. It simply cleans it and makes it look the best it can. Understandably, this is the point that creates a lot of confusion among consumers... how exactly to polish marble. Marble polishing in the sense of making a dull or honed marble shiny is not done by applying a chemical or polish. 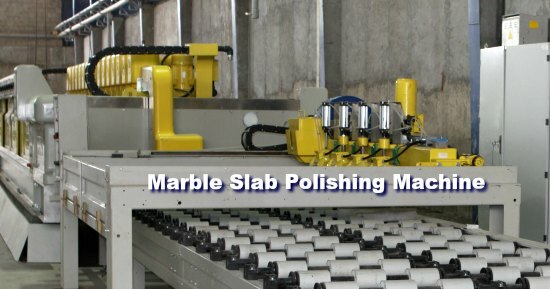 Creating the shiny finish on slabs or tiles is done by industrial marble polishing machines (see photo above) using intense friction. Or when already installed, it is done by a skilled and experienced professional employing specific knowledge while using special abrasives and tools. The best analogy is sanding wood. You start out with a rough or raw piece of wood (marble, granite) and proceed by sanding the wood with course sandpaper progressing to ever finer and finer grade sandpaper as the wood surface becomes smoother and smoother. Of course, you can stop at any point in the process depending on the color, pattern, texture and look you desire. It's essentially the same deal with stone, except it requires much more rigorous treatment to grind down and smooth the surface. It also requires far, far more skill to smooth and finish stone than wood. Thus, marble polishing to create a particular finish is not a DIY job. Etching repair is a different matter. As noted on the marble polishing & etch repair page a subtle distinction and point of clarification must be made regarding "etching"... a well-known marble cleaning and maintenance issue that is often confused with marble stains. Damage to marble countertops or floor tile occurs from contact with acidic foods or drinks and from using the wrong cleaning products (which unfortunately is nearly all common, generic and brand-name cleaners). It's called "etching". These dull spots, glass-rings and so-called "water spots" can occur no matter what type of surface finish, but etching damage is most noticeable on the shiny “factory” finish on marble. **You can repair etching using the Marble Polish / Etch Remover to bring back the shine if the surface is still smooth and not too severely damaged (some of the original finish is still intact). Of course, this product is for use on "polished" marble only. This is the one instance where a homeowner or do-it-yourselfer can actually polish marble to a shine. Most marble maintenance and marble repair issues aren't so perplexing and can usually be solved with DIY methods. So, the confusion about how to polish marble is certainly understandable given the "if, but, when" scenarios. Bottom line... the shine on marble is part of the marble itself and not from a "marble polish". If shiny polished marble becomes dull it is because it has been damaged. A shiny, polished finish on marble countertops or flooring can be damaged by acidic foods and drinks or using the wrong cleaning products or from simple wear from many years of use... but not because some product or chemical or "marble polish" has worn off.